Bet £5 and get £20 in free bets with Ladbrokes when you visit via My Betting Sites. Terms & Conditions: 18+ New UK+IRE customers. Paypal and certain deposit types and bet types excluded. Min £5 bet within 14 days of account reg at min odds 1/2 = 4 x £5 free bets. Free bets valid for 4 days on sports, stake not returned, restrictions apply. T&Cs apply.18+ New UK+IRE customers. Paypal and certain deposit types and bet types excluded. Min £5 bet within 14 days of account reg at min odds 1/2 = 4 x £5 free bets. Free bets valid for 4 days on sports, stake not returned, restrictions apply. T&Cs apply. What Does This Promo Code Do? This Ladbrokes promo code will allow you to take advantage of Ladbrokes’ welcome offer for new customers. This is currently bet £5, and get £20 in free bets. 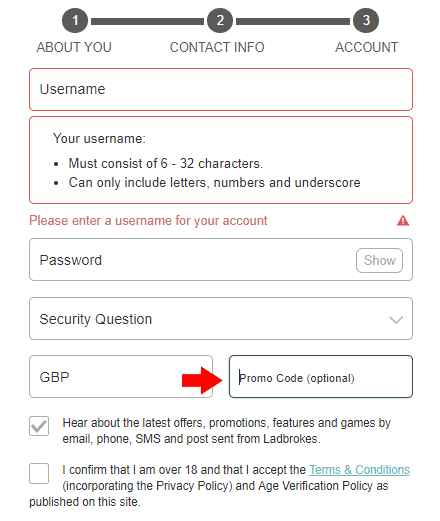 Where Do You Enter the Ladbrokes Promo Code? You must enter this code whilst registering to become a member at Ladbrokes. The registration process has three stages. The promo code is entered in the third section ‘account’, at the bottom. The screenshot and arrow below show where to enter the code. Yes. In order to receive the bonus, you must enter the promo code. The promo code field may already be pre-populated. This code is only for new Ladbrokes customers. However, on a daily basis, we update the My Betting Sites homepage with all of their existing customer offers. Just use the filtering options to find them as we do it for all bookmakers. If you’re considering joining Ladbrokes, here are some pointers that may help your decision. Large Recognised Brand – Ladbrokes is one of the most well-known brands in the Uk, both online and on the high street. If opening an account with Ladbrokes, you’ll know to be dealing with an established bookmaker. New Customer Offer – Ladbrokes currently have an offer for new customers to get free bets. Now is a good time to join. Sports Sponsorship – Ladbrokes’ sponsorship of sports totals tens of millions. Some of the higher profile sponsorships include darts, horse racing and the SPFL. Ladbrokes do have offers for existing customers, as well as new. They do have sporadic offers for other sporting events, such as football and horse racing but these are harder to predict. In March ’19 we saw the withdrawal of the football accumulator offer. Their insurance offer was one of the best available, and we assume that this will come back soon with some modifications. There have been quite a few offers for existing customers, that were exclusive to app users. They were not available on the website. This was how their Cheltenham offer was made available, so if you are a Ladbrokes customer, it is probably worth getting the app.